In sectors driven by fast-growth, the emergence of non-traditional competitors and markets challenges established business models. Practical guidance for software and technology companies on implementing the new revenue recognition standard. It seems everybody is concerned about mobile security. 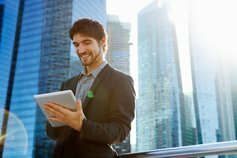 KPMG in Bulgaria’s Technology practice focuses on Technology including Software, Electronics, Computer & Peripherals, Communication & Networking Equipment as well as Business Services companies. Technological innovations and the drivers for new business models in many other industries create unrivaled opportunities. Most of the growth in the Technology sector in Bulgaria in recent years has been influenced by the increasing number of software developments and business services companies, a trend that has been stable over the last decade. At the same time, specialised electronics production, for example in the medical and automotive industries, has been gaining strength. Connected homes, cars and appliances, Cloud Computing, Big Data and Industry 4.0 are just some of the current trends in the environment calling for fast, reliable and efficient delivery of new products and services. The drive for increased operational efficiency, quality of service and ensuring information security is pressing new challenges on outsourcing companies and global shared service centers. The more complex and diverse use of technology in business and society, the greater the need to provide secure and reliable solutions. But security is only one aspect. Other challenges facing the industry are the intense global competition, falling prices in many product segments, short product life cycles and lack of an experienced work force. The high capacity for innovation and efficient business processes are the critical success factors for the business in the digital world. KPMG in Bulgaria’s Technology practice has in-depth knowledge and experience with industry issues and offers a wide set of solutions to support the Technology and Business Services companies’ growth agenda. Digital advances, the rise of social networks and the ‘internet of things’ are having a transformational impact on the volume, variety and velocity of data coming at organizations. On a monthly basis, we are featured in CFOagenda, a magazine that focuses on the challenges of adopting cloud within an organization. Maria Peneva is Audit and Risk Consulting Partner in KPMG in Bulgaria. Implementing cloud solutions without proper groundwork can throw up all sorts of challenges.